With the Recession in Rear View and Steadily Rising Real Estate Prices, is it Time to Invest South by Southwest? Worcester, Mass., November 29, 2017 — NeighborhoodScout®, powered by Location, Inc., released its latest Scout Vision® Trends & Forecasts Quarterly Report. Arming investors with past median home value data (quarter-by-quarter since 2000) and future 5-year home price appreciation rates, Scout Vision reveals that 4 out of the 5 top U.S. Metro Areas predicted to rise in real estate prices through 2022 are in the south and southwest. Like Phoenix rising from the ashes, the Las Vegas-Henderson-Paradise, NV Metro Area continues its storied comeback, as predicted in the previous Scout Vision report. With the Median Home Value expected to rise 35% over the next 5 years, it’s hard to fathom how down-on-your-luck the Las Vegas-Henderson-Paradise, NV Metro Area was following the 2008 financial crisis (see Figure 1). 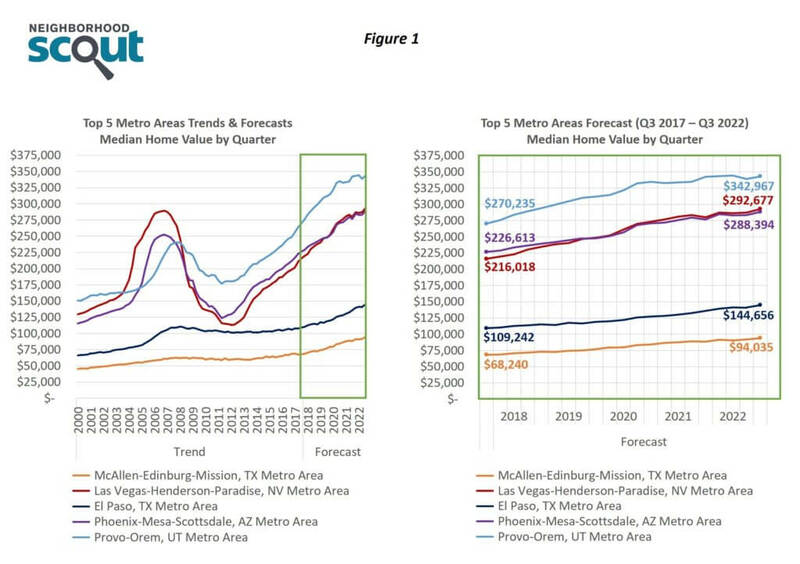 A similar boom-and-bust-then-renaissance is occurring in other parts of the southwest, including the Phoenix-Mesa-Scottsdale, AZ Metro Area, where Scout Vision predicts a 27% rise in real estate prices through 2022 (see Figure 1). Partially situated on the Rio Grande, roughly 70 miles from South Padre Island and the Gulf of Mexico, the McAllen-Edinburg-Mission, TX Metro Area earns top billing for future 5-year home price appreciation rates. While home prices aren’t high in the Metro, as a percentage they are forecasted to rise 38%, with the average Median Home Value jumping from $68,240 to $94,035 (see Figure 1). Arming investors with past median home value data and future 5-year home price appreciation rates, Scout Vision reveals that 4 out of the 5 top U.S. Metro Areas predicted to rise in real estate prices through 2022 are in the south and southwest. 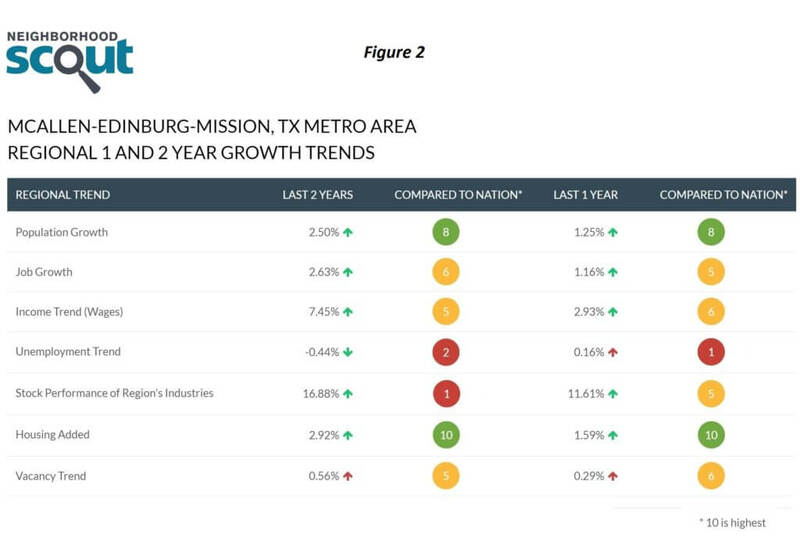 There are several factors contributing to the McAllen-Edinburg-Mission, TX Metro Area’s rise, including healthy population growth, very strong housing stock, and vacancy rates that have stayed in check (see Figure 2). There are several factors contributing to the McAllen-Edinburg-Mission, TX Metro Area’s rise, including healthy population growth, very strong housing stock, and vacancy rates that have stayed in check. To view the latest Scout Vision reports, including the list of U.S. Metros predicted to decline in real estate prices through 2022, visit NeighborhoodScout.